1724: born in Kyôto. His father is the actor Nakamura Kichisaburô II. He receives the name of Nakamura Kumetarô I and performs in miyaji shibai at the beginning of the 1730s. 1st lunar month of 1740: Kumetarô produces in Kyôto at Nakamura Wakadayû's theater the ni-no-kawari drama "Keisei Ujimiyama". 11th lunar month of 1740: Kumetarô produces in Kyôto at Miyako Mandayû's theater the kaomise drama "Asuka Miyako Jindai no Maki" and the kiri kyôgen "Hayazaki Taiheiki". The latter drama welcomes in Kyôto the actor Ogino Izaburô I. 11th lunar month of 1742: Kumetarô produces in Kyôto at the Minamigawa no Shibai the kaomise drama "Kaeribana Konrei Nagoya". 11th lunar month of 1743: Kumetarô produces in Kyôto at Hoteiya Umenojô's theater the kaomise program "Yomeiri Ôshimadai", which celebrates the shûmei of Sanjô Mankatsu. 11th lunar month of 1744: Kumetarô produces in Kyôto at Hoteiya Umenojô's theater the kaomise drama "Tanba Yosaku Kameyama Kayoi". 11th lunar month of 1745: Kumetarô produces in Kyôto Namiki Eisuke's kaomise program "Toragoyomi Hoteibukuro". 11th lunar month of 1746: Kumetarô produces in Kyôto at Hoteiya Umenojô's theater the kaomise drama "Tomi Yakata Ômu Kotoba"; his stage partners are Sawamura Sôjûrô I, Anegawa Shinshirô I, Sanogawa Jûkichi (final performance before his death), Nakamura Utaemon I, Nakamura Tomijûrô I, Nakamura Shingorô I (final performance before his death), Tamiya Jûzaburô I (final performance before his death) and Nakamura Kiyosaburô I. 11th lunar month of 1747: Kumetarô produces in Kyôto the kaomise program "Meiken Kogane Zukuri". Fall 1748: Kumetarô goes to Edo. 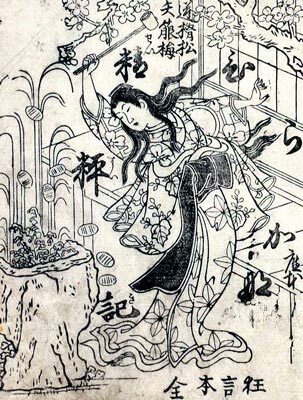 11th lunar month of 1748: Kumetarô plays at the Nakamuraza in the kaomise drama "Onna Moji Heike Monogatari". He achieves a great success by performing the 5 roles of a hengemono entitled "Kyô Ningyô Gohenge", made up of a dance in the tanzen style, a flower-adorned hat dance, a courtesan dance, a spear dance and a shôjô dance. 6th lunar month of 1749: the play "Kanadehon Chûshingura" is produced at the Nakamuraza for the first time; Kumetarô plays in the same theater the role of Okaru in the drama "Kanadehon Chûshingura"; the role of Hayano Kanpei is played by Nakamura Shichisaburô II [casting]. 11th lunar month of 1749: Kumetarô plays at the Nakamuraza the role of Kôtô-no-Naishi in the kaomise program "Onnô Taiheiki". 1st lunar month of 1750: Kumetarô plays in the same theater the role of Ôiso no Tora in the new year drama "Ôkazari Saiwai Soga". 11th lunar month of 1750: Kumetarô plays at the Nakamuraza in Tsuuchi Jihê II's kaomise drama "Wakaki no Ume Taira no Kiyomori". 11th lunar month of 1751: Kumetarô moves to the Ichimuraza and plays in the kaomise drama "Kamimukae Nigiwai Genji", which celebrates the shûmei of Bandô Hikosaburô II and welcomes in Edo the Kamigata actor Arashi Shichigorô I. 1st lunar month of 1752: Kumetarô's rank in the Edo hyôbanki, wakaonnagata section, is jô-jô-(hanshiro)kichi (superior - superior - almost excellent). He shares the same rank with Sanogawa Hanazuma II. 11th lunar month of 1752: Kumetarô plays at the Ichimuraza the role of Semimaru in the kaomise drama "Ume Sakura Ninin Semimaru". 7th lunar month of 1753: the play "Hirakana Seisuiki" is performed for the first time in Edo, at the Ichimuraza; Kumetarô plays the roles of Chidori and Umegae [casting]. 11th lunar month of 1753: Kumetarô plays at the Ichimuraza the role of Komachi in the kaomise program "Kamuri Kurabe Yatsushi Kuronushi", which celebrates the arrival in Edo of the actor Kasaya Matakurô I. 11th lunar month of 1754: Kumetarô plays at the Ichimuraza the role of Princess Tamayo in the kaomise program "Keisei Asakusa no Kane". 1st lunar month of 1755: Kumetarô plays in the same theater the role of Ôiso no Tora in the new year drama "Kodakara Aigo Soga"; the role of Tora's lover Soga Jûrô is played by Ichimura Kamezô I. 9th lunar month of 1755: Kumetarô performs his onagori kyôgen at the Ichimuraza, playing the role of the courtesan Yûgiri in Chikamatsu Monzaemon's drama "Keisei Awa no Naruto". He also performs one more time the hengemono "Kyô Ningyô Gohenge", which was staged for the first time in the 11th lunar month of 1748 at the Nakamuraza; the program is made up of a dance in the tanzen style, a flower-adorned hat dance, a courtesan dance, a spear dance and a shôjô dance. Fall 1755: Kumetarô goes back to Kyôto. 11th lunar month of 1755: Kumetarô plays at the Kitagawa no Shibai the role of Azuma no Omuku in the kaomise drama "Onna Monji Heike Monogatari". 1st lunar month of 1756: Kumetarô's rank in the Kyôto hyôbanki, wakaonnagata section, is jô-jô-(shiro)kichi (superior - superior - (white) excellent). 11th lunar month of 1756: Kumetarô plays at the Kitagawa no Shibai the role of the courtesan Kurenai in the kaomise drama "Ukematsuri Hôrai Yakata", which is produced by Somematsu Matsujirô. 3rd lunar month of 1757: Kumetarô plays in the same theater the role of Princess Taema in the drama "Narukami Fudô Kitayama Zakura"; the role of the wicked priest Narukami is played by Ichikawa Danzô III. 11th lunar month of 1757: Kumetarô becomes zamoto and produces at the Kitagawa no Shibai Sakurato Bunsaku's kaomise drama "Tsunomoji Keman no Yurai". 1st lunar month of 1758: first Kabuki adaptation of the 5 acts puppet theater drama "Gion Sairei Shinkôki", which is simultaneously produced at the Minamigawa no Shibai [casting] and the Kitagawa no Shibai [casting]; Kumetarô produces this drama in the latter theater and plays the roles of Princess Yuki and Kichô-no-Mae. Fall 1758: Kumetarô goes to Ôsaka. 11th lunar month of 1758: Kumetarô plays at the Naka no Shibai the role of Okyô in the kaomise drama "Shitennô Chikara Kurabe", which is produced by Arashi Kichisaburô I and celebrates the shûmei of Fujikawa Hanzaburô III. 7th lunar month of 1759: Kumetarô plays in the same theater the role of Onaka in the drama "Natsu Matsuri Naniwa Kagami". 11th lunar month of 1759: Kumetarô plays at the Naka no Shibai in the kaomise drama "Mibae Soga Azuma Tanzen", which is produced by Arashi Kichisaburô I. 7th lunar month of 1760: Kumetarô plays in the same theater the roles of Chidori and Umegae in the drama "Hirakana Seisuiki". Fall 1760: Kumetarô goes back to Kyôto. 11th lunar month of 1760: Kumetarô plays the role of the courtesan Tamagawa in the kaomise drama "Kiku Nagashi Kokka Taiheiki", which is produced in Kyôto by Nakamura Senzô. Fall 1761: Kumetarô goes to Ôsaka. 11th lunar month of 1761: Kumetarô plays at the Naka no Shibai in the kaomise drama "Miyo no Hana Yunzei Kagami", which is produced by Mimasu Daigorô I. 4th lunar month of 1762: first Kabuki adaptation of the 5-act puppet theater drama "Gosho Zakura Horikawa no Youchi", which is staged at the Naka no Shibai; Kumetarô plays the role of Shizuka Gozen [casting]. 9th lunar month of 1762: Kumetarô plays in the same theater the roles of Shizuka Gozen and Osato in the drama "Yoshitsune Senbon Zakura". 11th lunar month of 1762: Kumetarô plays at the Naka no Shibai the role of Uraha in the kaomise drama "Uchide no Kozuchi Tezuma Urakata", which is produced by Mimasu Daigorô I. 3rd lunar month of 1763: Kumetarô's rank in the Ôsaka hyôbanki, wakaonnagata section, is jô-jô-kichi (superior - superior - excellent). 7th lunar month of 1763: Kumetarô plays in the same theater the roles of Chiyo and Tatsuta-no-Mae in the drama "Sugawara Denju Tenarai Kagami". 9th lunar month of 1763: Kumetarô plays in the same theater the role of Kurofune's wife in the drama "Kurofune Deiri Minato"; the role of Kurofune is played by Mimasu Daigorô I. 11th lunar month of 1763: Kumetarô plays at the Naka no Shibai in the kaomise drama "Fuyu Gomori Kôbai no Iezuto", which is produced by Mimasu Daigorô I. 7th lunar month of 1764: Kumetarô plays in the same theater the role of Princess Tamaori in the drama "Ichi-no-Tani Futaba Gunki". 9th lunar month of 1764: première in Ôsaka at the Naka no Shibai of "Hare Kosode Tsuzure no Nishiki", based on the puppet drama "Katakiuchi Tsuzure no Nishiki", which is produced by Mimasu Daigorô I. A similar play was staged one day before under a different title, "Oriawase Tsuzure no Nishiki", at the Kado no Shibai. The competition for the best performance and the best line-up is open between the 2 theaters. The performance at the Kado no Shibai is more successful than the one at the Naka no Shibai; Kumetarô plays at the Naka no Shibai the role of Sahei's nyôbô [casting]. 11th lunar month of 1764: Kumetarô moves to the Kado no Shibai and plays in the kaomise drama "Momotarô Obako Banashi", which is produced by Nakayama Bunshichi I and celebrates the shûmei of Yoshizawa Ayame III. 2nd lunar month of 1765: Kumetarô plays in the same theater the role of Shigenoi in the drama "Koi Nyôbô Somewake Tazuna". Fall 1765: Kumetarô goes back to Kyôto. 11th lunar month of 1765: Kumetarô plays the role of Yoichi's wife (in reality a fox) in the kaomise drama "Kachidoki Asahi no Ôgi", which is produced by Ichiyama Sukegorô II and Yamashita Kyônosuke at the Minamigawa no Shibai and welcomes in Kyôto the Edo actor Ichikawa Danzô III. 1st lunar month of 1766: Kumetarô's rank in the Kyôto hyôbanki, wakaonnagata section, is jô-jô-kichi (superior - superior - excellent). 7th lunar month of 1766: Kumetarô plays in the same theater the role of the courtesan Hanjo in the drama "Keisei Sumidagawa". 11th lunar month of 1766: Kumetarô plays at the Minamigawa no Shibai in the kaomise drama "Yuki no Asa Daimonjitsu Miyako no Fuku", which is produced by Ichiyama Sukegorô II and Yamashita Kyônosuke. 11th lunar month of 1767: Kumetarô moves to the Kitagawa no Shibai and plays the role of Omiya in the kaomise drama "Daikokuten", which is produced by Onoe Montarô and Onoe Kumesuke and celebrates the shûmei of Bandô Yasuke and Bandô Sukesaburô II. 3rd lunar month of 1768: Kumetarô plays in the same theater the roles of Osono and Okaru in the drama "Kanadehon Chûshingura". 6th lunar month of 1768: Kumetarô plays in the same theater the roles of Chidori and Umegae in the drama "Hirakana Seisuiki". 11th lunar month of 1768: Kumetarô plays in Kyôto the role of Princess Sakura (in reality a fox) in the kaomise drama "Enmusubi Asahi no Shimadai", which is produced by Onoe Kumesuke. 11th lunar month of 1769: Kumetarô moves to the Minamigawa no Shibai. 3rd lunar month of 1770: Kumetarô plays in the same theater the roles of Owasa and Shizuka Gozen in the drama "Gosho Zakura Horikawa no Youchi". Fall 1770: Kumetarô goes to Ôsaka. 11th lunar month of 1770: Kumetarô plays at the Naka no Shibai the roles of Tamasasa and the fox Otaki in the kaomise drama "Ma'ichimonjiya Sakigake Hyôban", which is produced by Ogawa Kichitarô I. 1st lunar month of 1771: premiere at the Naka no Shibai of Namiki Shôzô I's drama "Kuwanaya Tokuzô Irifune Monogatari"; Kumetarô plays the role of the keisei Higaki [casting]. Kumetarô's rank in the Ôsaka hyôbanki, wakaonnagata section, is hakudai-jô-jô-kichi (almost grand - superior - superior - excellent). 8th lunar month of 1771: Kumetarô plays in the same theater the roles of Hinadori and Omiwa in the drama "Imoseyama Onna Teikin". 11th lunar month of 1771: Kumetarô goes to the Kado no Shibai and plays the role of the courtesan Konohana (in reality Nikaidô's daughter) in the kaomise drama "Ganjitsu Eiga no Toshikoshi", which is produced by Ogawa Kichitarô I. 3rd lunar month of 1772: Kumetarô plays in the same theater the role of Shigenoi in the drama "Koi Nyôbô Somewake Tazuna". 7th lunar month of 1772: Kumetarô plays in the same theater the roles of Shizuka Gozen and Osato in the drama "Yoshitsune Senbon Zakura". 11th lunar month of 1772: Kumetarô goes to the Naka no Shibai and plays the role of the koshimoto Shikinami and Shizuka Gozen in the kaomise drama "Onoe Kikugorô no Baranu Banashi", which is produced by Nakamura Utaemon I. 4th lunar month of 1773: Kumetarô plays in the same theater the role of Okaji in the drama "Natsu Matsuri Naniwa Kagami". Fall 1773: Kumetarô goes back to Kyôto. 11th lunar month of 1773: Kumetarô plays in Kyôto the role of Tamasasa in the kaomise drama "Etari ya Etari Tsuwamono Majiwari", which is produced by Yoshizawa Iroha I. 1st lunar month of 1774: Kumetarô's rank in the Kyôto hyôbanki, wakaonnagata section, is hakudai-jô-jô-kichi (almost grand - superior - superior - excellent). 10th lunar month of 1774: Kumetarô performs in the same theater the dance "Shakkyô". 1st lunar month of 1775: Kumetarô appears on stage for the last time, in Ôsaka at the Naka no Shibai, playing the role of Ofusa in the drama "Kumetono Aiaigasa". The first ideogram of this title is the same as the first one in Kumetarô; the second ideogram is the first one in the first name of Kumetarô's stage partner Nakamura Jûzô II, who plays the role of Ofusa's lover Tokubê. Kumetarô decides to retire and becomes a priest. He calls himself Kaiin and settles in Ôsaka, near the famous Tennôji temple. 15th day of the 7th lunar month of 1777: Kumetarô dies. Nakamura Kumetarô I was talented and popular Kyôto onnagata actor. He was able to play almost any kind of female roles, excelling in musume, hime and keisei roles. He was nicknamed wakaonnagata no meika, "the celebrated flower of wakaonnagata".